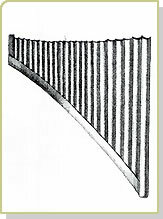 The miskal was one of the instruments classified in organology as a "multi-bored flute." Also known as the "Pan flute," the multi-bored flute is one of the oldest instruments invented by mankind, and has been used nearly everywhere in the world. In the great majority of pan flutes, the lower ends of the pipes are closed. Today, they are common in different forms in Romania, Korea and South America. The Ottoman Turkish word miskal is believed to be a corruption of the Persian musikar. Like several other instruments, the miskal also came to the Ottomans from Iran. Structurally identical with the Romanian nai, the miskal was very popular in Turkish music until the middle of the 18th century, but was later abandoned. There were two sizes of miskal. The larger of the two was known as sah mansur, the smaller as küçük mansur. Used more in secular music, the miskal was played indoors as the sole wind instrument or together with the ney; in outdoor celebrations it was played alongside the zurna.